I didn't run at Dartford parkrun event 11 because I had some pain in the upper part of my left foot that I was worried about. After a visit to the podiatrist/chiropodist (apparently they're exactly the same thing - who knew?) it was confirmed that I do not have a stress fracture, which I had suspected was causing the pain, but some kind of strain. That was good news, but instead of jumping straight back into running, I continued the week's training by commuting four out of the ten journeys to and from work (4x30km rides) on my bike and made a note to have a test run at Dartford parkrun event 12. I woke up on the morning of event 12 to the sound of rain, and as I left home I popped over to the car to retrieve my trail shoes but with the rain coming down, I was hit by the urge to stay dry so I accidentally drove the car over to the park. It was good to have the experience of finding and parking up in the official car park, but not one that I intend to repeat too often. For the record, the rain stopped just in time for the run. This was the first week to date that I had not had to transport the stanchions over to the park. Instead our storage box was being used for the first week. The big change with this is that me and Richey now have to get across to the far side of the park to collect the signage before setting up, it makes the setup procedure a little different but we still managed to get it all done in time. With that done, we were pretty much ready to go - the runners and volunteers started to arrive and I watched Richey in his element as he briefed the finish funnel team. It was brilliant watching him in full flow! Earlier in the week I had been informed that some tourists were coming to visit us, and I was pretty excited by this news. Just before run start time I spotted them and said a quick hello, I had a few pre-run things to sort out, so dashed off to take care of them. I was a little nervous about my first run for two weeks. I knew I would be a little slower than usual, but that was fine. Just to be in a position to be able to consider running me made happy enough. In the end a lot of the faster crowd were resting their legs before the first cross-country race of the season that afternoon, so although I was slower I still finished in p2, but more importantly was happy to have remained under 20 minutes. I had a fun duel with a fellow runner as we approached the finish line and I somehow managed to pip him to the post. As always, I headed over to the desk to pick up my scanning equipment and my hi-vis jacket. 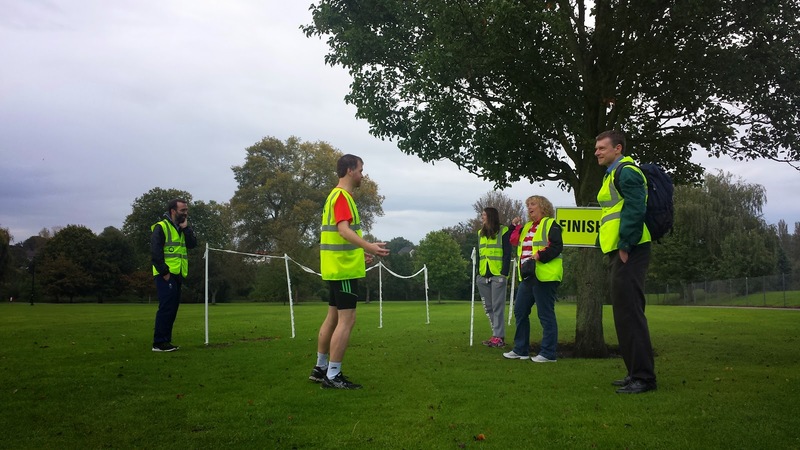 This week Tessa was away so I was joined by Richey as co-barcode scanner - it was his first time in this role and it looked like he was really enjoying himself talking to the runners as he scanned their barcodes. With that all done, Richey got on with the results processing while I headed off with two of my SLGR team mates to collect the remaining course signage. Back in the clubhouse I spotted an interesting scene. 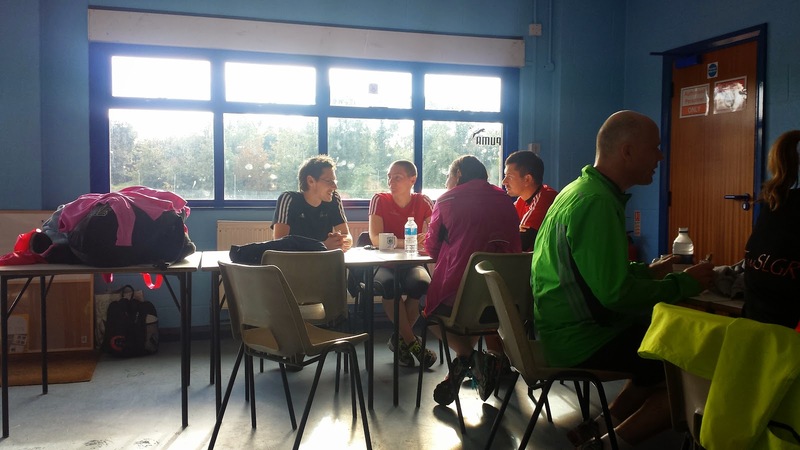 There were three tables of parkrunners and I would have felt equally at home on any of them. In the end I played musical chairs between the results processing table and the volunteers' table, where I spent some time chatting to Louise (blog: abradypus), Helen (blog: helsbels) and Stephen (blog: running the tube lines). 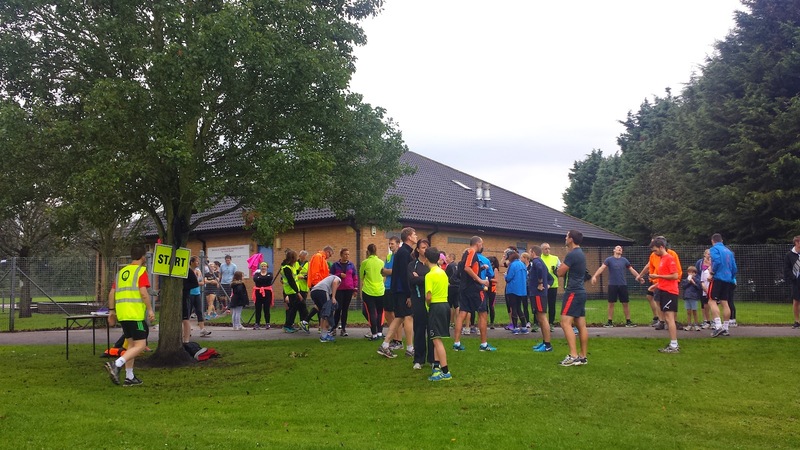 You can read Louise's brilliant blog on Dartford parkrun - here. 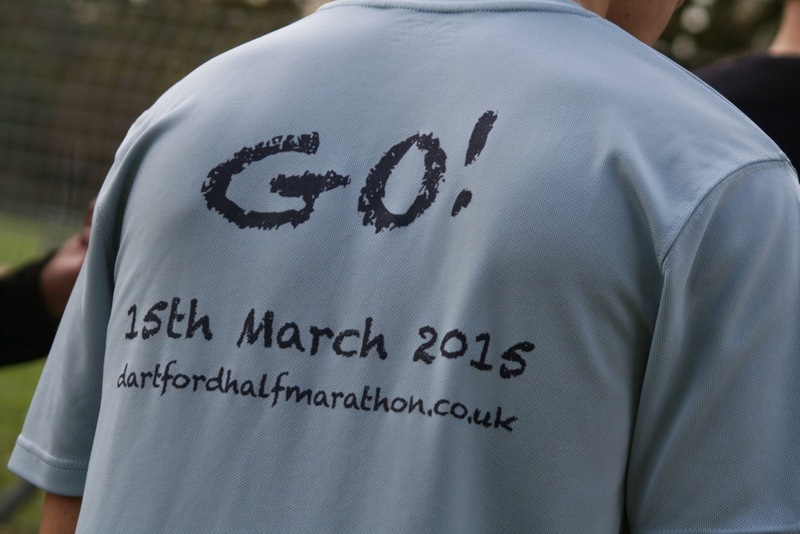 After that, I decided to buy one of the Dartford Harriers' Dartford Half-Marathon 2015 tech tees (xs) - I say 'I' but Brian 'SLGR' Page helped me out with my post run cash flow problem (apparently someone spent most of my money on tea and crisps). So I'm really pleased to be able to support the Harriers by promoting their event by wearing the tee-shirt while out running over the next few months especially after everything they have done, and continue to do, to support Dartford parkrun. 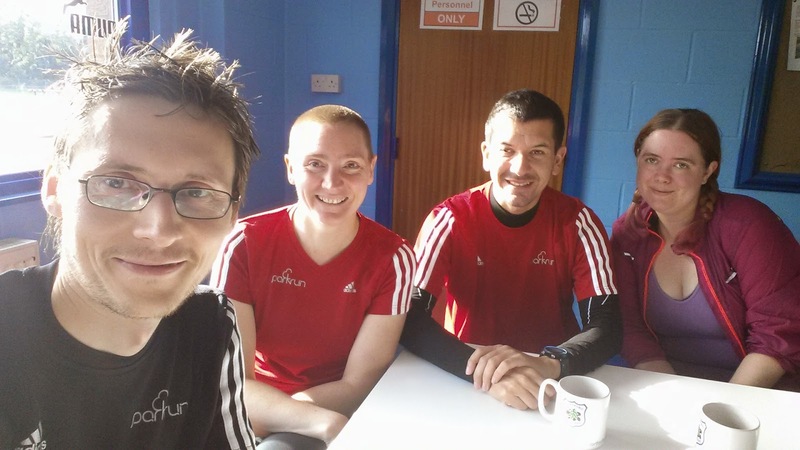 I may have mentioned this before but I'm feeling quite cosy in the Dartford running community right now.